Happy Birthday Michael Stuhlbarg! Let's talk about "slave girls." It’s a presumptive moment of exposure. One man guesses what another man is too afraid to say, but he goes further than the first man could’ve expected. No, Emmit Stussey wasn’t talking about slave girls, but his exchange with Sy Feltz became one of the stand-out comedic moments of “Fargo” Season 3, if not the series to date, because of the miscommunication. Beyond that, it’s also a telling illustration of the duo’s relationship. Sy wants to protect Emmit; more than that, he wants to do what Emmit is incapable of doing, for the good of their company. For those who’ve finished Season 3, you know why Stuhlbarg used the past tense there. Despite a mutually beneficial relationship on and off the clock, the partners’ friendship was wrecked by an interfering foreign force: V.M. Varga corrupted the waters, Emmit became suspicious of his most trusted ally, and Sy paid the price. Instinct honed by commitment, as Stuhlbarg is a true student of the stage and screen. He grew up in California and studied at UCLA, but his acting education spanned from Juilliard in New York to a conservatory in Lithuania with stops in London and Oxford along the way. He shows up to read-throughs off-book (when he has the time) and sees each performance as a daunting challenge that’s rewarding enough to make the experience addictive. “If you’ve prepared enough, it’s like flying,” he said. 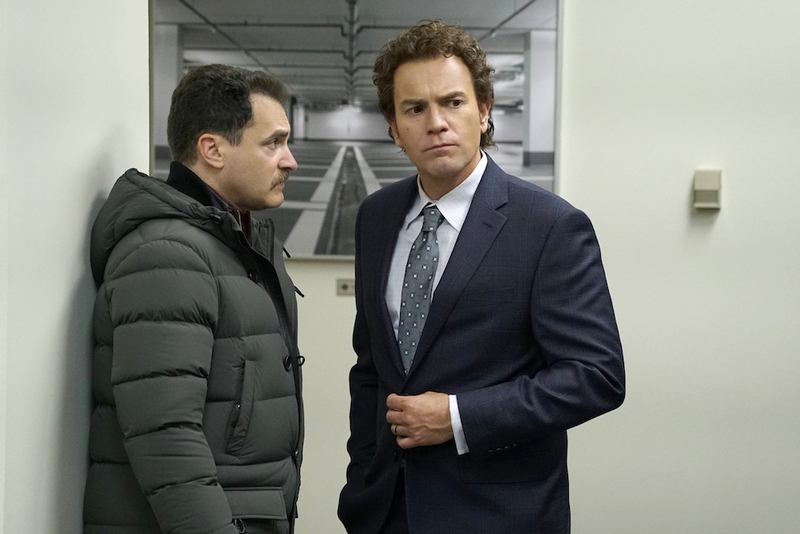 Stuhlbarg didn’t know much about Sy’s journey when he signed on for “Fargo” Season 3, but his connection to the Coen brothers — who directed him in “A Serious Man,” for which Stuhlbarg earned a Golden Globe nomination in 2010 — proved helpful in exploring the character. You can see the extremes in Stuhlbarg’s performance, but you don’t see the strain. Despite not knowing where his character was going from the start, Sy feels like the most lived in, authentic Minnesotan of this year’s group. Stuhlbarg digs into every moment; even a two-word response others may have cast aside as pure comedy gets the instinctive timing of a scared man looking to protect his friend from too daunting a truth. “Slave girls” carries so much more than it should, and it sticks with viewers because of it. As far as Sy’s character goes, the Shakespearean thespian hopes he’s remembered for his empathy and his passion. “I hope they can find themselves getting caught up in what he had to struggle with, and enjoy the disjointed feelings that he went through. I will take some of that with me, as well,” Stuhlbard said.